Maine-et-Loire (French pronunciation: ​[mɛn.e.lwaʁ]) is a department in west-central France, in the Pays de la Loire region. 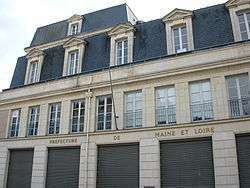 Maine-et-Loire is one of the original 83 departments created during the French Revolution on March 4, 1790. Originally it was called Mayenne-et-Loire, but its name was changed to Maine-et-Loire in 1791. It was created from part of the former province of Anjou. Its present name is drawn from the former province of Maine and the Loire River, which runs through it. Maine-et-Loire is part of the current region of Pays-de-la-Loire and is surrounded by the departments of Ille-et-Vilaine, Mayenne, Sarthe, Indre-et-Loire, Vienne, Deux-Sèvres, Vendée, and Loire-Atlantique. 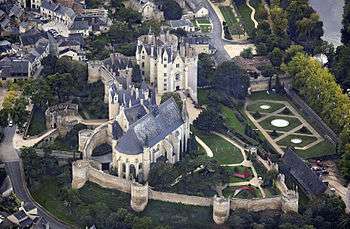 It has a varied landscape, with forested ranges of hills in the south and north separated by the valley of the Loire. The highest point is Colline des Gardes (689 feet/210m). The inhabitants of Maine-et-Loire have no official qualifier. They are sometimes known as Angevins, from the former province of Anjou, or Mainéligériens, from the name of the département. The Loire Valley and its castles. The largest vineyard of the Loire Valley. The Angers castle and the Apocalypse Tapestry, the largest tapestry in the world. The Château de Brissac, the tallest castle of the Loire Valley. The crooked spires in Baugé region. The Cadre Noir, one of the most famous horsemanship school in the world. Around Saumur, the largest concentration of troglodyte house in Europe. The Royal Abbey of Fontevraud and the graves of the House of Plantagenet, including Richard I of England. The Tank museum of Saumur, which display the largest tank collection in France. The textile museum of Cholet, and the creation of the famous red and white handkerchief. The fortified city of Pouancé and its medieval castle. The Blue Mine, a slate mine, with a funicular which goes 130 meters under the surface. ↑ "Vous voulez vous appeler Angevin ou Mainoligérien ? Dernier jour pour voter !". ouest-france.fr. Ouest France. Retrieved 30 July 2014. 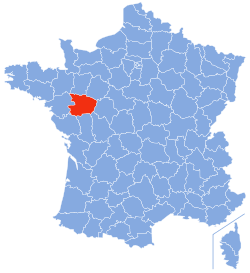 Wikimedia Commons has media related to Maine-et-Loire. "Maine-et-Loire". Collier's New Encyclopedia. 1921.